A long table of Italian vintners settle into conversation at San Francisco’s own A16 Restaurant. They come to witness where their bottles are uncorked nightly. The come to meet the owners face to face. They come taste Southern Italy on their palates. Nearby, colleagues look over butcher paper covered table tops. Some are native to SF and others traveled here. Tonight we soak in Italy. We are pulled by a gravitational force from a busy kitchen where carbohydrates flow like lava. The wine list might as well have been written in Chinese since bottles were plucked from the shadows of the Italian landscape. You would have to be wandering hermit or obsessive compulsive to know all of these treasures. We shed the daily grind of selling or fixing or strategizing. Conversations around information technology ebb to anecdotes of boots abroad and favorites at home. Then we just disappear into the fabric of this restaurant. Since it’s after 7pm, the first order of business is an an order of appetizers and a glass of inky red. Yes to the special app of chicken meatballs with sauce brewed from cherry tomatoes and caramelized onion. And yes to that genie trapped inside of the bottle from Basilicata. The sommelier’s description descends like new fallen snow. I endure the gentle ribbing from my peers who watch me melt into her charm. A slice of Italian heaven miles from the grimy gray of the work week. We left that shore for adventure. Let’s see where they take us. Surprisingly we agree to eat family style. Order what you want, but expect food to fly around. Business colleagues with plans to swap plates like cousins at a picnic. We break through the convention in favor of curiosity. How much could we taste in one night? We need to find out. The entree’s arrive nearly at once. 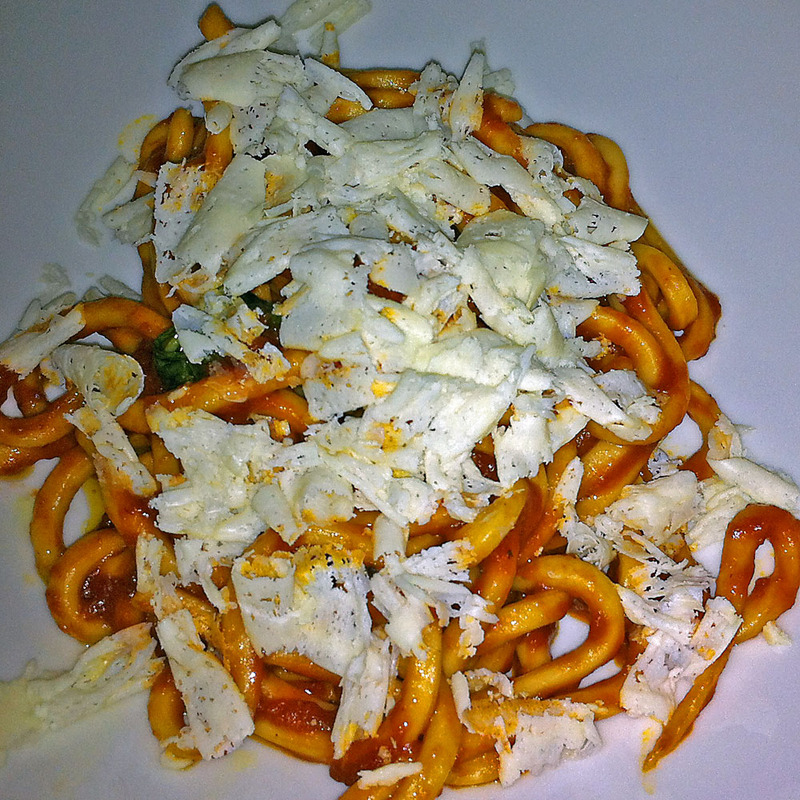 A brick red Neapolitan ragu hugs long, elastic pasta made by hand. <picture at top of the post> The shape might be called pici or strongozzi in the Tuscany or Umbria. Here, we are introduced to it as “maccanorana” and with a meat sauce without the traditional ground beef that the word ragu implies. That version would not be from Naples, rather Emilio-Romano. Further South pork is favored. On top rests house-made ricotta salata. A creamy sour note to the earthy, tomato chords underneath. The other pasta sang from the balcony. These short tubes bathe in a sauce conjured from dried fava bean powder and meyer lemons. The mouthfeel, the tang, the herbal notes sends pasta in an entirely new direction. Shaved pecorino romano rounds out the palate. The effect is evocative of the dry, late summer breeze as Autumn pokes its head around the corner and kisses the landscape with clay colors. Something from Eric’s past surely has him haunted by mushrooms. I think that once his eyes hit the description of that pizza everything else fell out of focus. Fortunate for us, he is as generous as insightful. 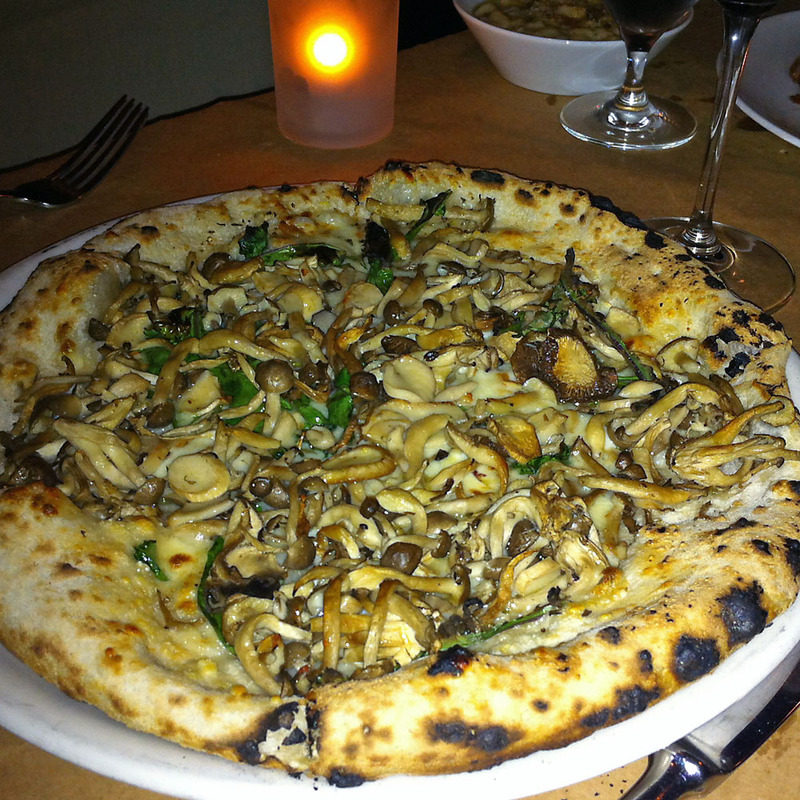 Those slices of pizza weighted by exotic mushrooms were held in suspense by smoked mozzarella. The combination of fungi driven meat flavor blanketed by cream and a fireplace aroma quieted the table. It quieted the tongue. It brought us back to earth and stone. To mossy thoughts alone in a forest of our minds. And one soul at this table had the courage to take the pure protein path. Porchetta in all the splendor of adult sized bacon. Like a rainbow of meat and fat glistening after a spring rain. Crisp and chewy. A man’s man’s dinner. Unafraid. Bold. Smokey testosterone. Clearly the vegetables are only a foil. A dab of color and texture to show off the act on the main stage. Oh yeah. Italians eat this way too. And when they do, it’s a simple adoration of flavors. A16 reminds us to embrace the world as the Italians do. Honoring tastes simply and with full force. To steep in fellowship. And strike connections with our hands on the same piece of bread. Let us stay nourished together.